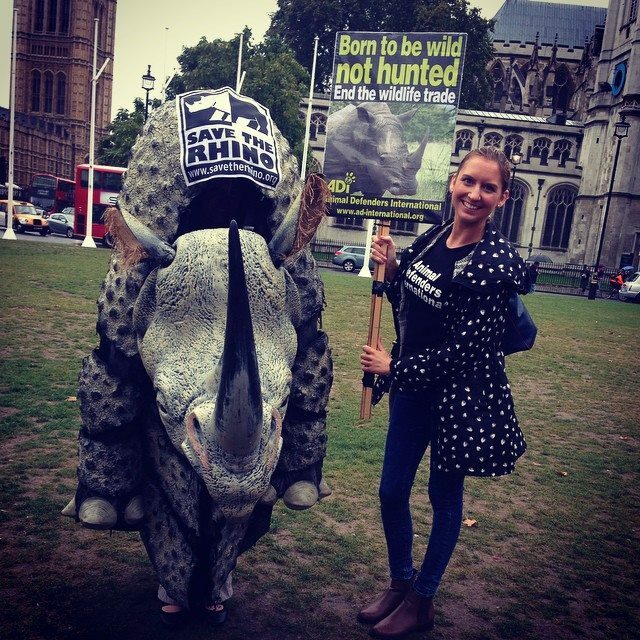 On October 4th, I took part in the Global March for Elephants and Rhinos in London. This was a great experience and it was brilliant to see so many people coming together for such an important cause. There were around one thousand people in London, and many more in cities all over the world. Even though it rained the whole time, this didn’t dampen our spirits as we marched to raise awareness about the ivory trade that kills so many elephants and rhinos every year. The march was started with an empowering speech from Stanley Johnson, then continued along the streets of the city, ending up at the Houses of Parliament where there were a series of speeches from inspiring people including Nicky Campbell. Much like the process of shark finning where the fins are cut off the sharks and they are thrown back into the ocean to die, the tusks or horns are cut off the elephants and rhinos and they are then left too. With shocking statistics such as the fact that more than 35,000 elephants are killed every year for their tusks and a rhino is slaughtered every 9-11 hours for their horn, now is the time to do something about this before it is too late. There is a very real possibility of extinction for these incredible animals in the not too distant future. Coming together for an event like this made me feel apart of something really special. We can change the fate of elephants and rhinos, but we need to speak up while we still have the chance to.